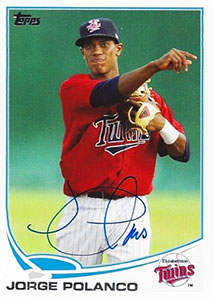 Jorge Polanco was born on Monday, July 5, 1993, in San Pedro de Macoris, Macoris, Dominican Republic. Polanco was 20 years old when he broke into the big leagues on June 26, 2014, with the Minnesota Twins. His biographical data, year-by-year hitting stats, fielding stats, pitching stats (where applicable), career totals, uniform numbers, salary data and miscellaneous items-of-interest are presented by Baseball Almanac on this comprehensive Jorge Polanco baseball stats page. Jorge Luis Pacheco Polanco is an active Major League Baseball player who has spent his entire career playing for the Minnesota Twins organization. Chulo, his nickname, was signed by the Twins , just one day after he turned sixteen years old! On August 29, 2017 , Jorge Polanco hit a home run from each side of the plate in the same game , just the fifth player in Twins history to accomplish the unique feat.